We are excited to tell you about the Quilt Luminarium coming to Fort Walton Beach, FL, on February 2-3, 2019. THERE'S SPACE AVAILABLE and you might not want to miss this unique two-day event. How Does Quilt Luminarium Differ From Ricky’s Previous Super Quilt Seminars? Quilt Luminarium has some cross-over curriculum from the Ricky Tims Super Quilt Seminar, but this event offers a wealth of new and insightful information never presented before. • It's for ALL Quilters! • Learn, laugh, and be inspired! • Everyone attends all sessions! • You will love it! Money Back Guaranteed! Click HERE for information on classes or to register online. Are you curious about what Embroidery Software can do for your designs? Learn how to take your machine embroidery to the next level of creativity by changing, customizing, or designing an original. 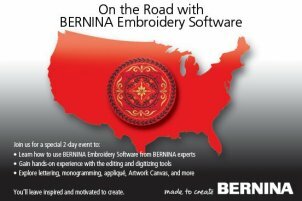 Come learn the outstanding capabilities of BERNINA Embroidery Software 8 from BERNINA’S Software Specialist, Debbi Lashbrook. Gain hands-on experience with editing, lettering, monogramming, and software basics on Day 1. During the second day, applique, Artwork Canvas, and manual digitizing will be explored. This is software only - no embroidery machine needed for class.